John DRYDEN (1525 – 1584) was Alex’s 12th great grandfather, one of 8,192 in this generation of the Miner line. His son Erasmus was made a Baronet, and two of his descendants were literary stars of the 17th and 18th Centuries. He was great grandfather of John Dryden (1631 – 1700) and the 2nd great grandfather of Jonathan Swift (1667 – 1745). John Dryden was born about 1525. His parents were David DRYDEN and Isabel NICHOLSON. He married Elizabeth COPE in 1553 in Canons Ashby Parish, Northamptonshire, England.. John died on 30 Sep 1584. Elizabeth Cope was born about 1529. Her parents were Sir John COPE and Bridget RALEIGH. Elizabeth died 30 Sep 1584. Elizabeth was sole heiress of Sir John Cope, through whom the Drydens inherited Canons Ashby House, an Elizabethan manor house located in Canons Ashby, Daventry, Northamptonshire, England. It has been owned by the National Trust since 1981, although “The Tower” is in the care of the Landmark Trust and available for holiday lets. It has been the home of the Dryden family since its construction in the 16th century. The manor house was built in approximately 1550 with additions in the 1590s, in the 1630s and 1710; it has remained essentially unchanged since the 1710s. John Dryden had married Elizabeth Cope in 1551 and inherited, through his wife, an L-shaped farmhouse which he gradually extended. 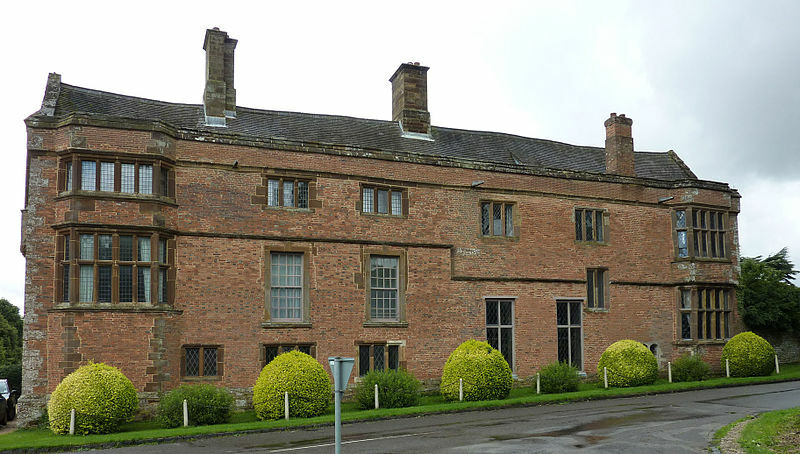 In the 1590s his son, Sir Erasmus Dryden completed the final north range of the house which enclosed the Pebble Courtyard. 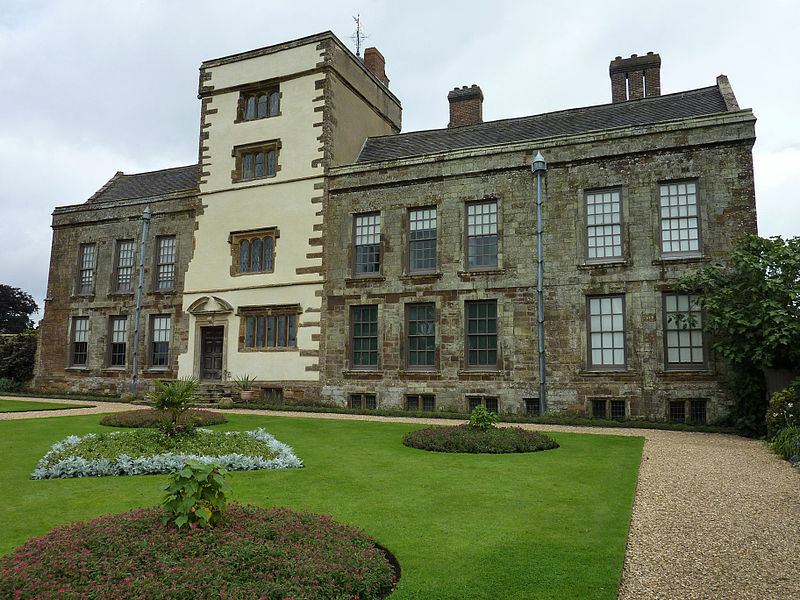 The interior of the house is noted for its Elizabethan wall paintings and its Jacobean plasterwork. The house sits in the midst of a formal garden with colourful herbaceous borders, an orchard featuring varieties of fruit trees from the 16th century, terraces, walls and gate piers from 1710. There is also the remains of a medieval priory church (from which the house gets its name). Erasmus entered Magdalen College, Oxford in 1571 aged 18. and was demy from 1571 to 1575 and fellow from 1575 to 1580, being awarded a Bachelor of Arts on 11 June, 1577. In 1577, he was student of the Middle Temple. He was High Sheriff of Northamptonshire in 1599 and in 1618. Erasmus, a strong Puritan and London grocer, purchased a the Dryden Baronetcy on 16 November 1619. In 1624, Dryden was elected Member of Parliament for Banbury in the Happy Parliament. i. Mary Dryden m. Sir Edward Hartopp, 1st Bt., son of William Hartopp and Eleanor Adcock. ii. Elizabeth Dryden m. Sir Richard Philipps, 2nd Bt., son of Sir John Philipps,1st Bt. and Anne Perrot. John Dryden (wikipedia) b. c 19 Aug 1631, d. 12 May 1700; An influential English poet, literary critic, translator, and playwright who dominated the literary life of Restoration England to such a point that the period came to be known in literary circles as the Age of Dryden. Walter Scott called him “Glorious John.” He was made Poet Laureate in 1667.
iv. 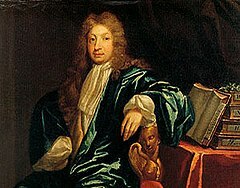 Sir John Dryden, 2nd Bt. d. bef. 11 Nov 1658; m1. Priscilla Quarles, daughter of unknown Quarles; m2. Anna Parvis, daughter of Henry Parvis; m3. Honor Bevill, daughter of Sir Robert Bevill, on 3 July 1632. He succeeded to the title of 2nd Baronet Dryden, of Canons Ashby, co. Northampton [E., 1619] on 22 May 1632. He held the office of Member of Parliament (M.P.) for Northanptonshire. He held the office of High Sheriff of Northamptonshire in 1634.
v. William Dryden buried 24 Dec 1660; m. [__?__] Cave. He lived at Farndon, Northamptonshire, England. George was left land in Adstone by his father. George married Katherine Throckmorton as her second husband. Katherine was the daughter of Clement and Catherine (Neville) Throckmorton of Hasely, co. Warwick. She married first Thomas Harby of Adston [Adstone, Northamptonshire]. She married third John Wilmer of Shrowley. Katherine was a first cousin of Lady Elizabeth (Throckmorton) Raleigh. Lady Elizabeth was Sir Walter Raleigh‘s wife, and a Lady of the Privy Chamber to Queen Elizabeth I of England. Their secret marriage precipitated a long period of royal disfavour for Raleigh. I don’t know how closely George’s grandmother Bridget Raleigh was related to Sir. Walter. Bridget Dryden was born in 1563 in Canons, Ashby, Northamptonshire, England. Her parents were John DRYDEN (1525 – 1584) and Elizabeth COPE (1529 – 1584). Bridget was sister of Sir Erasmus Dryden,1st Baronet (1553–1632) If I count my relatives correctly that makes them second cousins once removed. John Dryden was also a second cousin once removed of Jonathan Swift. After Francis died, she married in 1620 in London to Thomas Newman. Bridget died 02 Apr 1645 in Berkhamsted, Hartford, England. Jonathan Swift Sr. d. c 1666 m. Abigail Erick. He was admitted to King’s Inn, Dublin. He was a native of Goodrich, Herefordshire, accompanied his brothers to Ireland to seek their fortunes in law after their Royalist father’s estate was brought to ruin during the English Civil War. Jonathan Sr. died at Dublin before his son was born, and his mother returned to England. 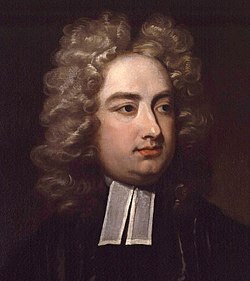 He his son, the famous Jonathan Swift in the care of his influential uncle, Godwin, a close friend and confidante of Sir John Temple, whose son later employed Swift as his secretary. Jonathan Swift (30 Nov 1667 – 19 October 1745) was an Irish satirist,essayist, political pamphleteer (first for the Whigs, then for the Tories), poet and cleric who became Dean of St. Patrick’s Cathedral, Dublin.He is remembered for works such as Gulliver’s Travels, A Modest Proposal, A Journal to Stella, Drapier’s Letters, The Battle of the Books, An Argument Against Abolishing Christianity, and A Tale of a Tub. Swift is probably the foremost prose satirist in the English language, and is less well known for his poetry. He is also known for being a master of two styles of satire: the Horatian and Juvenalian styles. This entry was posted in 14th Generation, Historical Site, Line - Miner, Wikipedia Famous and tagged John Dryden, Jonathan Swift, Lady Elizabeth (Throckmorton) Raleigh, Sir Erasmus Dryden 1st Baronet. Bookmark the permalink. Elizabeth Cope inherited nothing from her father. Wilkyn’s farm came to John Dryden through a marriage settlement in 1551. John Dryden BUILT Canons Ashby house and purchased the remains of the Canons Ashby estate from Sir John Cope’s nephew and heir Edward Cope (Elizabeth’s cousin) in 1574. I have good circumstantial evidence that John Dryden’s mother was not Isobel Nicholson as the Visitation of Northamptonshire (1564) records. The pattern of Coats of Arms / Crests in a room at Canons Ashby implies a different lineage. Contact me if interested. Mr. McCallum, I would be interested in your reply to the mother of John Dryden not being Isobel Nicholson and who you feel was his mother and any reference you have. You can contact me at anntigger60@hotmail.com Thank you! My apologies. I now withdraw the interpretation concerning Dryden ancestry. A revised interpretation is that none of the 35 Arms within the room at Canons Ashby relate to Dryden. They all have Elizabeth Cope as their focal point via her own family (Cope), Spencer (Jane, her grand-mother) and Raleigh (Bridget, her mother). I conclude that the purpose of the Arms was as an initiation into the Cope / Spencer / Raleigh dynasty which from this point forward (c1580) is the new dynasty of Dryden. The displays of Latin inscriptions, technical drawings (instruments of geometry /astronomy and maps) and allegories (ancient Greek and Roman history / literature) in the room provide the family’s intellectual and moral values. The whole assembly therefore is directed at Elizabeth / John Dryden’s children and grand-children.